An early foggy morning reverse aerial establishing shot of a typical Western Pennsylvania residential neighborhood. Pittsburgh suburb. An overcast morning establishing shot of a typical Western Pennsylvania neighborhood. Pittsburgh suburbs. An early foggy morning forward aerial establishing shot of a typical Western Pennsylvania residential neighborhood. Pittsburgh suburb. An early morning foggy aerial establishing shot of a typical Western Pennsylvania residential neighborhood. Pittsburgh suburbs. 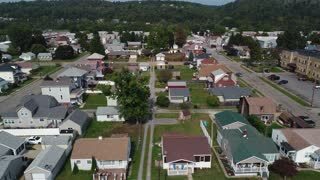 An aerial establishing shot of a typical Western Pennsylvania residential neighborhood in late summer. Pittsburgh suburbs. A reverse aerial establishing shot of a typical Western Pennsylvania residential neighborhood on a frosty late-Autumn morning. Pittsburgh suburbs. Shot at 60fps. 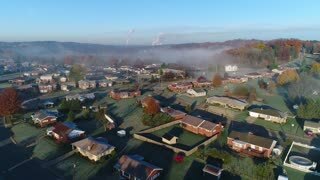 A forward rising aerial establishing shot of a typical Western Pennsylvania residential neighborhood on a frosty late-Autumn morning. Pittsburgh suburbs. Shot at 60fps. An early Spring slow forward aerial establishing shot of a typical residential neighborhood in a Western Pennsylvania small town at dusk. Pittsburgh suburbs. A dusk early Spring slow forward aerial establishing shot of a typical residential neighborhood in a Western Pennsylvania small town. Pittsburgh suburbs.